Pylon Network – Updated White Paper & Token Paper Are Out Now! In our previous blog post, we presented an outlook of the events and actions planned for February – a very busy and exciting month for Pylon Network. One (or two) of the reasons why February is so exciting, is what we are announcing in this post! 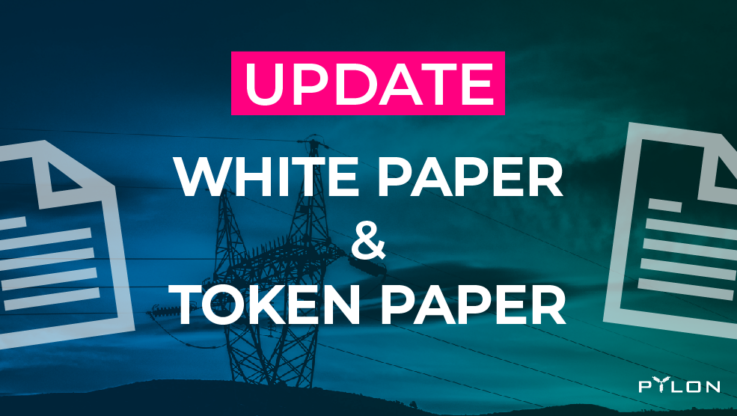 – The White Paper will define the most updated value propositions of Pylon Network and its future implementation/commercialization path in the energy sector. It is not intended to provide a detailed business plan; the purpose of this document is rather, to become the guiding compass for the development of the project in the years to come and to reflect our vision about the key role that Pylon Network has to play in the future energy system, after one year of valuable interactions with international energy stakeholders and the invaluable lessons we took away from this engagement. – The Token Paper will provide the most updated information about Pylon Network’s digital infrastructure future developments and achieved milestones. Most importantly, the Token Paper will provide new information regarding the structure of PYLNT and PYLNC, as well as their relationship that will rule them, once Pylon Network Mainnet is launched. From the numerous requests of our community during the past year, we know that both are expected with great anticipation. Now, that the time has come, we would like to engage with everyone who is interested to learn more, provide feedback or offer their help, while we are moving ahead. The easiest way to do any of that is by joining the official Pylon Network channel on Telegram app; there you can get in touch, directly, with the team and the rest of Pylon’s community. All our social network and communication channels can be found here. Enjoy the read and looking forward to hear your comments and thoughts!